Who says that vinyl wraps are only for businesses and their fleet vehicles? When a La Mirada, CA homeowner contacted Superior Signs and Graphics, the upgrade of bland company trucks was not the reason for the call. Rather, this homeowner wanted the look of a gorgeous wood garage door without paying an arm and a leg to have one installed. With a basic white garage door in good shape, we came out and did a site evaluation. The garage door was a perfect candidate for the application of premium vinyl wrap. Choosing a 3M product because of its superior longevity and durability, we took in the look of the homeowner’s front door – made of wood – and of the colored driveway when deciding on the print. Shutterstock had a selection of photos that featured the type of old wood that the client liked. Since the color did not quite match, we added a red tint to the images to match the front door’s hue and harmonize with the driveway. If you area ready to change the look of your Orange County home with garage door wraps, consider the amazing results with got in La Mirada. The wood look is uncanny, and you have to perform a close inspection to realize that this wood is actually little more than stamped vinyl wrap. Fitting the surface like a glove, the wrap does not prevent or adversely affect the movements of the door or usage of the garage. So, what happens when you want your garage door updated, upgraded or just beautified? Site evaluation. We take a look at your garage door and the way that it folds open. The mechanics of the door influence the installation of the wrap. Photo selection. 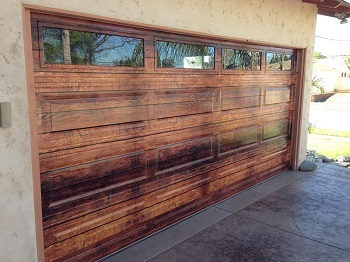 Do you want to match the look of your garage door to the look of your front door? Then again, we can add a far more whimsical photo. Some clients have chosen to mimic the appearance of an open garage with a fighter jet, a fire engine, a racecar or a boat inside. There is no limit to the kind of look that you can choose. Color choice. Manipulating the color of the chosen picture is quite simple. Lighten it, darken it or add a different tint that makes the door more suitable to your landscape and home. Not just for homeowners. We do not only offer this service to homeowners. In fact, plenty of business owners have discovered that their garage doors or loading dock gates can be greatly enhanced with the use of a wrap. 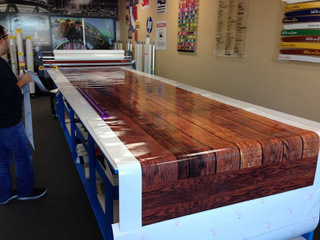 Take your brand awareness building and reinforcement of name recognition to the next level with these great vinyl wraps! 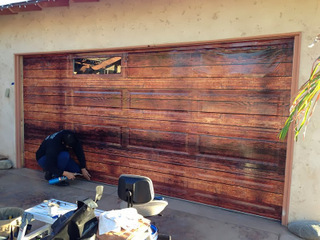 What A Difference Garage Door Wraps Make! 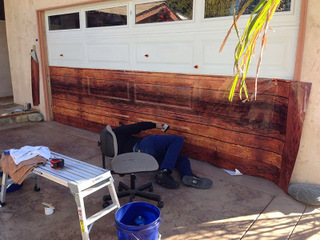 When it comes to installing garage door wraps, La Mirada, CA, home and business owners know that only an expert in the field will offer excellent results. Your real property is one of your biggest investments. Moreover, a wrap lasts for a long time. Making sure that the quality of the wrap and of the installation is superior in every way ensures your long-term enjoyment of the product while it adds value to the property.